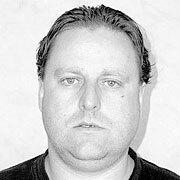 In April of 2004, Mike Danton (or Mike Jefferson, depending on who you speak to) and 19-year-old Katie Wolfmeyer were arrested and charged with hiring a hit man to kill Mike's agent, David Frost. News reports didn't admit to Frost being the alleged target at first, but as more and more details surfaced, the more obvious it became. The reason I'm choosing to archive this story on this site is because the parallels between this case and Sheldon's were too similar to be passed off. Not only that, but in the days following the arrest, Sheldon's name was mentioned twice in two different posts on two different boards. So I did a little research, and decided that details about the case should be posted here. The delight was plainly written across Mike Danton's face. His eyes were alive with excitement. He wore an open-mouthed, gap-tooth grin as he skated into the open arms of his St. Louis Blues' teammates. Danton had just scored the first playoff goal of his young NHL career. The 23-year-old from Brampton, Ont, was on top of the world. Just a few days later Danton's world would fall apart. 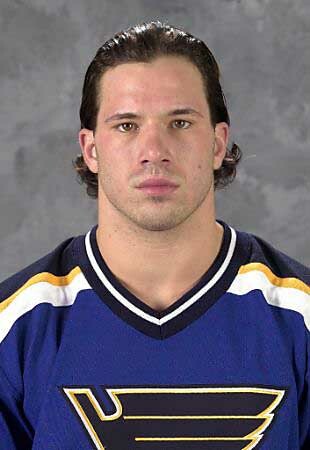 On April 16th, two days after the Blues were eliminated from the Stanley Cup playoffs, police in California arrested Danton, accusing of him of plotting to commit a murder. What followed was a whirlwind of unbridled speculation about Danton, his upbringing, his friends and the people running his hockey career. There were rumours of homosexuality, promiscuity, substance abuse and child neglect. On one side there are Danton's parents, who claim that svengali-like agent David Frost corrupted their son. On the other side is Frost, who says Danton's parents were unfit and he's only doing what's best for his protégé. In the middle is Danton, who waits for the court to decide his fate. On May 21, a federal judge denied bail for St. Louis Blues forward Mike Danton, ordering him to remain in jail until his trial begins. U.S. District Judge Michael Reagan agreed with prosecutors, ordering that the 23-year-old native of Brampton, Ont., - who is accused of plotting to have his agent David Frost killed - was a potential flight risk and a possible danger to the community if allowed out on bail. More details into Danton's alleged murder-for-hire plot emerged during nearly four hours of testimony. FBI agent John Jimenez testified that Blues teammate Ryan Johnson described the player-agent relationship as "strange and bizarre." Johnson, Danton's roommate on road trips, told the FBI agent that Danton and Frost would talk by telephone or text-message each other constantly each day, Jiminez said. What is Mike Danton accused of doing? A criminal complaint filed in a federal court in Illinois alleges Danton and a woman, 19-year-old Katie Wolfmeyer, attempted to hire a man to kill an unnamed acquaintance, who Danton had earlier quarrelled with. That argument, according to the police, involved "promiscuity and use of alcohol" by Danton, who "begged the acquaintance not to go to [Blues general manager Larry Pleau] ... and ruin his career." According to police, the NHL hockey player offered a hitman $10,000 to kill the unidentified male at Danton's St. Louis-area apartment. The murder was to be made to look like a botched burglary. Both Danton and Wolfmayer are charged with conspiring and using a telephone across state lines to set up a murder. Both have pleaded not guilty. The exact nature of Wolfmeyer's relationship with Danton is unclear. Most reports suggest the two are just friends and not romantically linked. Federal authorities say Wolfmeyer confessed to putting Danton in touch with a man who was willing to carry out the murder-for-hire plot, someone authorities have described as a "co-operating witness" for the FBI. Wolfmeyer's lawyer denies that confession ever took place. Wolfmeyer's family is stunned by the allegations. The 19-year-old has been described by relatives as hard-working "all-American girl." 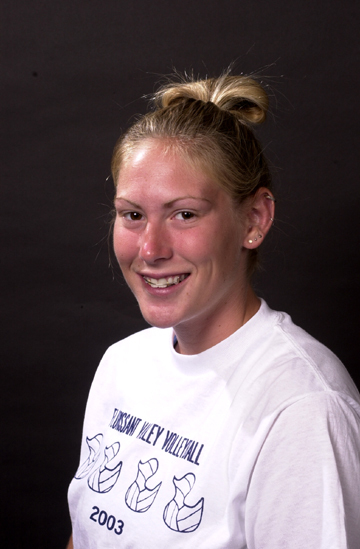 Wolfmeyer was studying nursing at St. Louis Community College, where she played volleyball and lacrosse. The girl's family believes Wolfmeyer met Danton while she worked at a shopping mall located near the Blues' practice facility. Who was the targeted "acquaintance" in the alleged murder-for-hire plot? According to federal prosecutors, Danton was plotting to kill his long-time agent, and confidant, David Frost. On at least three occasions over the last six months, say police, Danton tried to hire a hitman to murder Frost. Frost has denied Danton wanted him killed and said the truth will come out in court. According to the FBI, Danton said he set up the plot because he feared for his life. Danton, say authorities, told Wolfmeyer that he needed to hire a hitman to kill some mysterious man who was coming from Canada to murder him over a financial debt. "The only way that I'm going to be able to sleep tonight is knowing that the guy trying to kill me is done himself," Danton is quoted as saying in the criminal complaint. "I'm pretty much begging. "I wouldn't resort to this if it wasn't a matter of life and death." Police say there is no evidence that a hitman was after Danton. Frost says the hitman was the product of Danton's deluded mind, adding Danton wasn't thinking straight because he was depressed and on pain medication and sleeping pills. Frost described Danton as a "good kid" who needs immediate psychiatric help. Other rumoured targets have included Danton's estranged father Steven Jefferson, or his brother Tom Jerfferson. Initial reports claimed that Danton was trying to kill his gay lover. Is that true? It remains to be seen. The idea that Danton was trying to murder his gay lover came not from the facts, but from an interpretation, or misinterpretation, of statements made in the criminal complaint. The court document describes a recorded phone call between Danton and the target of the alleged plot. "The acquaintance called Danton and asked Danton why he wanted to have him killed," it states. "Danton broke down and sobbed. Danton explained that he felt backed into a corner and also felt that the acquaintance was going to leave him. Danton did not want to allow the acquaintance to leave him, therefore decided to have him murdered." That statement suggests a strong emotional connection between Danton and the acquaintance. What is not certain is the nature of the relationship between the two men. Initially, many news outlets were reporting the alleged murder plot was a lover's spat gone bad. But most of the people close to Danton deny that he's gay. And in recent weeks, the media's conventional wisdom has changed. Frost, the man police say Danton tried to kill, isn't believed to be a sexual partner, but instead an agent with what has been described as an unusual control over the hockey players he represents. What is Danton's relationship with David Frost? The most enigmatic in character in the entire Danton drama is Frost. His link to Danton is just as enigmatic. Some have praised Frost as a hockey teacher and nurturer of young players. Others have expressed concern over the cult-like devotion he gets from many of the young players in his stable like Danton, Shawn Cation and Sheldon Keefe. John Gardner, head of the Greater Toronto Hockey League, told the Toronto Star that Frost "practiced mind control." But in 1999, Stephen Jefferson, Danton's father, called Frost "the best thing to ever happen to my kid." Jefferson introduced his son to Frost about 12 years ago, when Mike was 11 years old. Jefferson believed Frost could help his son realize his dream of making it to the NHL. Frost started off as Danton's coach and eventually became his agent. As time passed Frost's influence grew beyond the business of hockey. If he wasn't at school or playing hockey, Danton would spend most of his time with Frost. The Jeffersons' role in their son's life was reduced to a minor one. Stephen Jefferson would go watch Danton play, but wasn't allowed contact with his son before or after the games. "[Danton] was like a lemming," Edena Phillips told the St. Louis Post-Dispatch. Phillips, who billeted Danton – then 16 -- at her house while he played for the Ontario Hockey Association's Quinte Hawks, also said "his parents didn't seem to have any say in his life whatsoever ... It was all David Frost." Eventually, Danton cut his parents out of his life all together. Since Danton's arrest, Stephen Jefferson has lashed out against Frost, calling him a "monster " and a "manipulator" and blaming him for his son's problems. "He stole Michael from us and now he's taken Michael's mind from him," Jefferson told the Globe and Mail. "Since Michael was 15 years old, Michael has never said a word that came out of his own mind. He's just a tape recording. It was his words and [Frost's] thoughts." Why doesn't Danton want a relationship with his parents? In recent years, Danton has gone to great lengths to distance himself from his parents. In 2002, he officially changed his last name from Jefferson to Danton. The name came from a colleague he met at a hockey camp. The Jeffersons haven't seen Danton in nearly four years. Danton claims the estrangement is a result of his "very troublesome" upbringing. In a statement issued weeks after his arrest, Danton said as a child his parents subjected him "constant physical and emotional abuse." Danton says he was raised in squalid conditions without many of the basic necessities. Frost and several of Danton's friends have made similar statements. "I cannot tell you how badly [Danton] wanted to get away from his past. That was his motivation, it seemed," Shawn Cation, one of Frost's other protégés, told the St. Louis Post-Dispatch. "And who wouldn't? He wanted to get as far away from his family as possible." Family members and friends of the Jeffersons on the other hand, say they are unaware that any abuse took place. Danton's father, Steve Jefferson, said he was shocked by his son's allegations. "I'm really hurt by it. His mother will be floored," he said. "That's Dave Frost talking … it hurts the family to hear that type of nonsense from him, but it just shows how badly Mike needs help." What does David Frost say when asked to explain his unusual relationship with Danton? Frost scoffs at concerns that he wields a svengali-like influence over his flock. He doesn't make apologies and maintains that his actions have always been in the best interest of the young hockey players he represents. "If having too much influence means my players go to school, they maintain 75-plus averages, they work hard in games, they don't stay out at night, they never break curfew -- if that means too much influence, then I'm guilty," he told the Toronto Sun in a 1999 interview. One of the more curious twists in the Danton story is the current state of Frost’s relationship with Danton. Frost is his client’s chief public voice, orchestrator of media interviews and access to Danton, and been his most prominent defender. All this from a man who police believe was the target of Danton’s murder-for-hire plot. What is next for Mike Danton? Danton is currently being held in a jail in Illinois. His trial scheduled to begin on July 20, 2004. Charged with conspiring and using a telephone across state lines to set up a murder, Danton faces up to 20 years in jail and $500,000 US in fines if convicted. Obviously, the status of his NHL career is also very much in question. It’s true that teammates have been solid supporters of his since his arrest. But even if acquitted, Danton's contract with the St. Louis Blues expires on June 30 and it’s uncertain whether the hockey club plans to retain his rights.